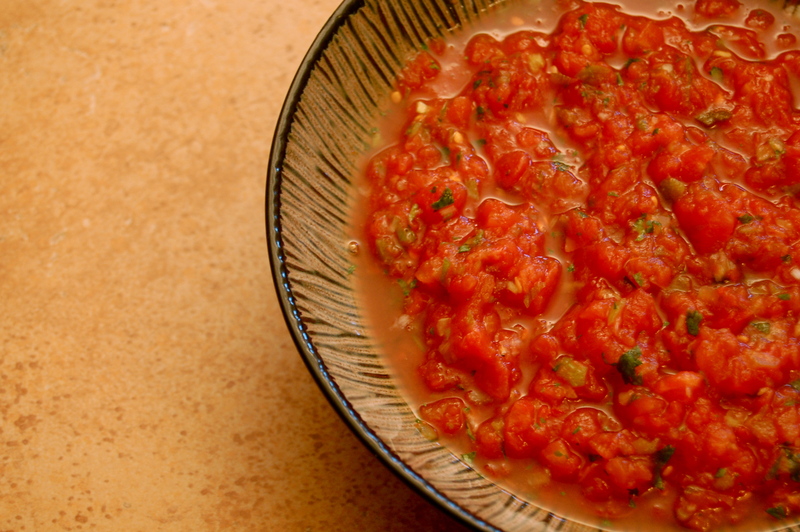 Nate’s good friend Lokey requested we post a recipe for salsa. First, let me say that salsa is really like a signature. Everyone has his/her own way of doing it. My aunt puts a little ketchup in hers. Lindsey and Jesse add extra garlic. I like all kinds of salsa. I’m not too fond of those you find in the grocery store. However, salsas from Frontera Kitchens usually don’t let me down. Pace Picante Sauce reminds me of when I was a kid and we got those big ½ gallon jugs from Sam’s. We have made a lot of salsa. We have also debated fresh tomatoes or canned tomatoes. I say tomato, you say tomato… Here’s our stance: If you have homegrown, really, really ripe tomatoes at your disposal – go for it! But if you are going to use grocery store tomatoes – use canned tomatoes instead. 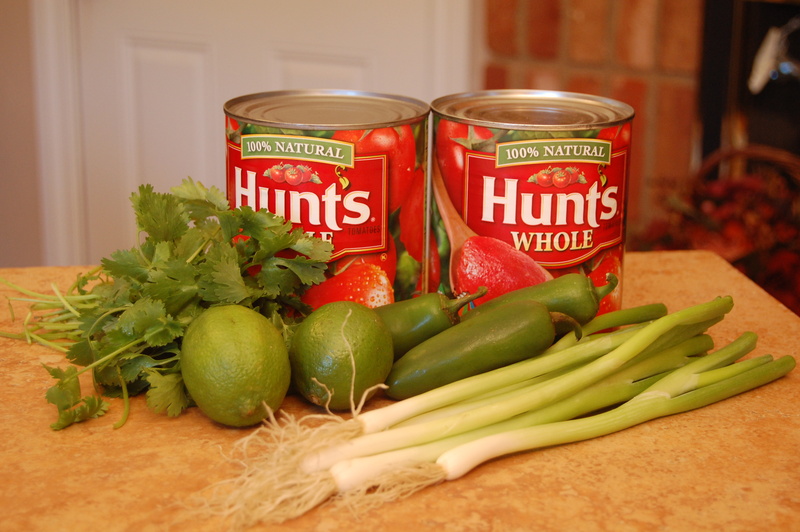 It may sound a little strange, but grocery store tomatoes don’t taste as good as canned tomatoes in salsa. That’s how we see it anyway. This is one of several recipes that we use. It is our basic, go-to salsa. We prepare ours in a food processor, but it can be done in a blender with similar results. We like to add the tomatoes last so we can control the consistency. Directions: Place all ingredients, except the tomatoes, in a food processor and pulse. When the onions and peppers are diced up well, add the tomatoes. Pulse to desired consistency. 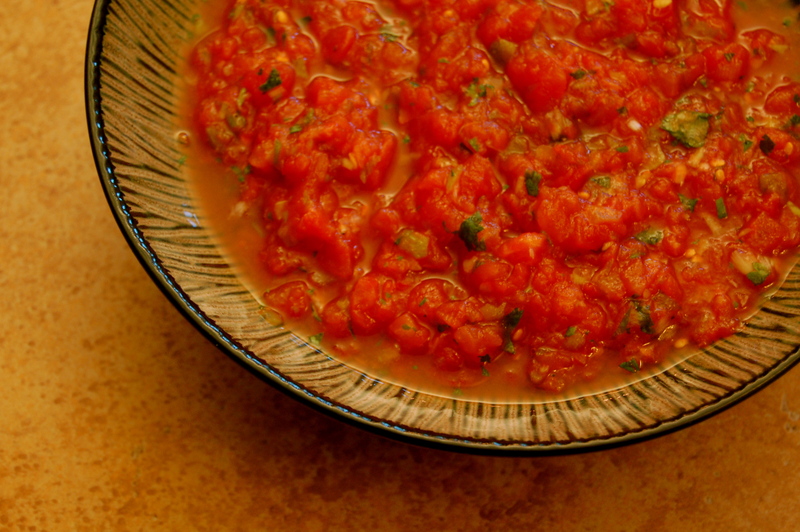 This salsa will keep in the refrigerator for only a couple of days, so eat up! All I can say is….mmmmmm. When are you & Nate gonna start a cable access cooking show? Of course, it would soon be picked up by the Food Network & then you’d have to move to La-La Land. So, just keep your tasty secrets here.